It seems that every year I play fewer and fewer games. But here are the ones that occupied my time in 2008. 1. Guitar Hero I/II/III/Rocks the 80s I went kinda GH crazy during the first part of the year, but these games are loads of fun. 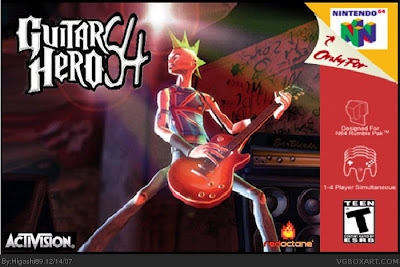 Who would've thought that one could rock out to the Stone Roses, Weezer, and the Beastie Boys in a video game? I am a golden god. 2. Audiosurf Ten of the best dollars that I spent this year were on this game. It builds tracks based on songs in your mp3 library, in which you guide your little space car on them, and pick up/avoid blocks that are synced to the music. It sounds very simple - and it is - but, like GH, it's a winning combination of music and gaming. 3. The Incredible Hulk: Ultimate Destruction Smashing stuff up real good is a lot of fun. Note: Much like with books, I rarely play or buy a game during the year its released, it seems. I've been wanting an Xbox 360 for quite a long time, but now I have access to a friend's GameStop employee discount, so this may be the year. Or not. You can still get N64 games? Well I'll have to wait for the version for the new MacBookWheel. yes i know it came out years ago, but im still obsessed with the cosmos!!!! Katamari Damacy and We Love Katamari are, in addition to being the two most Japanese things that I've ever seen, among my favorite video games ever. One of the reasons that I want an Xbox 360 is so I can play Beautiful Katamari.